Joe Howard started on the front row and grabbed the lead in Turn 1 and never looked back in his debut the Media Mayhem school bus race at Charlotte Motor Speedway’s Bojangles’ Summer Shootout. Read about all the races and the results. Watch the Independent Tribune video about Mark Plemmons’ attempt at bus racing. A new Dean Smith Award has been established and the award and scholarship program begins next October. Here is the ACC Digital Network’s report including Coach Roy Williams. The Pigskin Preview Luncheon will be held on July 23 at the Embassy Suites in Cary. Registration starts at 11:00AM and program will commence at 11:30AM. The inside scoop on the upcoming college football season will be shared by those that know best…..Duke’s David Cutcliffe, East Carolina Ruffin McNeill, North Carolina Central University Jerry Mack, North Carolina State University Dave Doeren and University of North Carolina Larry Fedora. There will be an opportunity to ask a question via the website, www.nffbilldooleychapter.org, “Contact Us” form. The emcee, WRAL Jeff Gravley, will randomly select questions for the five coaches to answer at the event. On August 23, 1995, Coach Bill Dooley, one of the “winningest” coaches in the Atlantic Coast Conference history, invited Athletic Directors, Coaches and Representatives from the University of North Carolina, Duke, North Carolina Central and North Carolina State University to join him and NC Governor, Jim Hunt, at the State Capitol Old Senate Chambers. It was at that meeting that the universities pledged their support to the newly formed NFFCHOF Chapter and its mission. Since its inception, Executive Director Bill Dooley has worked to promote chapter growth. In 2012 East Carolina University joined the Chapter. In 2014, the NFFCHOF Board of Directors unanimously voted to name the chapter after its founder. Today the Bill Dooley Chapter ranks as the largest in the country. Each year the Chapter awards up to 38 scholarships to high school football student athletes in Wake, Orange, Durham and Pitt counties. This year is the 20th year of honoring these young men. Area media members will be making headlines on Tuesday, as they get the buses rolling in the Media Mayhem School Bus Race during round four of the Bojangles‘ Summer Shootout Series at Charlotte Motor Speedway. The smack talk is circulating amongst the media as they prepare to bring the heat to this year’s 13-ton-machine battle. “I’m heading for first. It is time to kick the TV people out of the spotlight,” said on-air host Chris Rozak from radio station 106.5 The End. 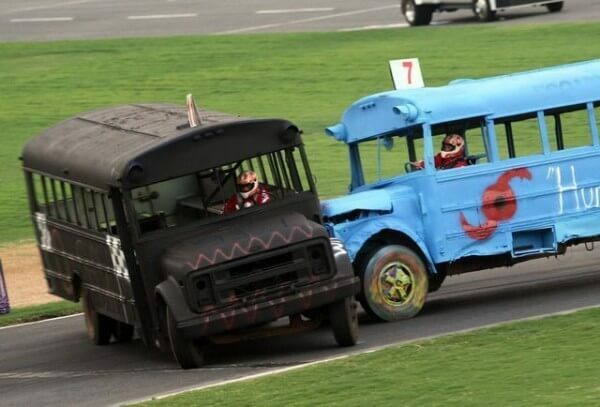 2014 Media Mayhem School Bus Race Champion and Time Warner Cable News meteorologist Matthew East will return to Charlotte Motor Speedway to defend his title. “The view from the mountaintop is gorgeous. Many try to get up here. Only one is sitting here though, and I don’t plan on leaving anytime soon. Get your popcorn ready, cause I’m going to put on a show,” said East. Other media members that will be competing include Brandon Davidow from WCCB; Danny Harnden of WGHP; Ashley Stroehlein from WBTV; Gerald Jackson from WCNC; Lawrence Gilligan of WSOC; and Mark Plemmons from The Independent Tribune. Studios and Sports departments are drama-filled as the media members prepare to shift gears from reporting to racing. “Even though I have no prior experience driving a school bus, Mr. East better watch his back,” said rookie driver Mark Plemmons. Tuesday’s Media Mayhem School Bus race is just one of many exciting races that will take place during the Bojangles’ Summer Shootout Series. The series gives fans the opportunity to watch the best grassroots racers from around the country doing battle in seven Legend Car and Bandolero divisions. With the area’s most affordable family fun, Charlotte Motor Speedway is the place to be on Tuesday nights. Admission to the Bojangles’ Summer Shootout Series is FREE for children ages 13 and under, and adult tickets are only $8. With interactive games, concessions, souvenirs, a kids’ play area and all the on-track thrills, Charlotte Motor Speedway packs each night with entertainment galore. Starting Monday, June 22, check your local Bojangles’ for a $2 off coupon. Tickets are available in advance at the speedway ticket office and at Gates 4 and 5 the night of the race. Parking is free. Spectator gates open at 5 p.m. with preliminary action starting at 5:10 p.m. Opening ceremonies are scheduled at 7 p.m. and feature races are scheduled to conclude by approximately 10 p.m.
For tickets to the Bojangles’ Summer Shootout Series, call the Charlotte Motor Speedway ticket office at 1-800-455-FANS (3267) or visit the website. Keep up with all the latest news from the speedway by following us on Facebook and Twitter or by downloading the new Charlotte Motor Speedway mobile app.